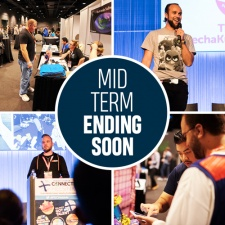 There are just days left to save up to $150 on the price of tickets to May's Pocket Gamer Connects Seattle. Mid-term prices end at midnight Thursday, April 18th, after which they’re full price forever. Book now! As well as the buzzing expo space packed with the latest titles from the best indie developers, the packed conference schedule features nine conference tracks across both days of the conference, May 13th to 14th. More than 125 expert speakers will address the hottest topics and latest trends across mobile games, handheld consoles, and VR and AR. You can check out some of the amazing speakers here and here. Partner event, PC Connects, lands Stateside for the first time in Seattle with a further four unmissable tracks for any PC games professional. Blockchain gaming stars as one of the featured tracks on day two, which will feature talks of how to implement blockchain into your game, the impact of cryptocurrency and opportunities it offers developers in the future. No other event puts you in touch with the entire mobile gaming industry like Pocket Gamer Connects. From our online Pitch & Match meeting scheduler - free to all delegates - to the SpeedMatch sessions that pair developers with publishers in a series of speed-dating style meetings, PG Connects helps you make the connections that are crucial for your business. New for 2019, Investor Connector pairs pre-selected professionals looking for funding with interested investors active in the sector for pre-qualified one-on-one meetings. Of course, it wouldn't be a Pocket Gamer Connects without our Global Connects Party on the first night. Whether you’re there for the free bar, finger food, music and dancing the night away or to carry on networking into the night, the party itself is worth the price of admission - which is more affordable with our MId-term prices. Save money - book now! Don’t be that person who lets a bargain slip away - all tickets will be full price from Friday, so what are you waiting for? Save $150 and book now!